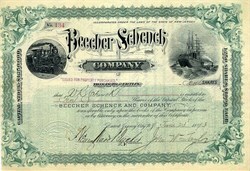 Beautiful certificate from the Beecher Schenck and Company issued in 1893. 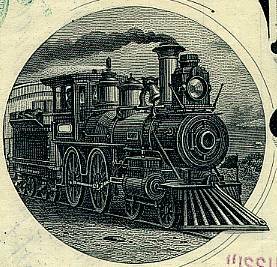 This historic document was printed by the New York Banknote Company and has an ornate border around it with a vignette of a train and a ship. This item has the signatures of the Company’s President, and Treasurer, John W. Taylor and is over 116 years old. FOUR ARE NOW INDICTED; Members of the Defunct Firm of Beecher, Schenck & Co. in Trouble. GROSS FRAUDS ARE CHARGED Col. H.B. 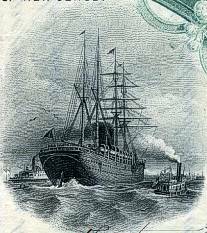 Beecher and Vincent R. Schenck Furnish Bail -- Midgley in the Tombs and Taylor Now in Arizona. The Grand Jury found indictments Wednesday against Col. Henry B. Beecher of Yonkers, Vincent R. Schenck of Jersey City, William E. Midgley, now in the Tombs on other indictments, and John W. Taylor, formerly of New-York, but now of Arizona, who constituted the firm of Beecher, Schenck Co. from 1890 to 1893.